This Schwaiger remote control is the perfect addition to the "Green Guard" system. The system is conveniently activated and deactivated via the remote control instead of via entering a PIN code on the center unit for example. 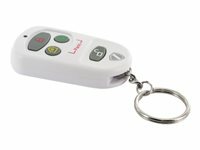 The remote control can also be used to activate an immediate panic alarm in order to frighten off intruders. This product only works in combination with a center unit and cannot be used individually.